It took thirty years of fishing Jamaica Bay for James “Frank the Fish” Culleton to build his home and business, and it took only one night for the bay to reclaim them. 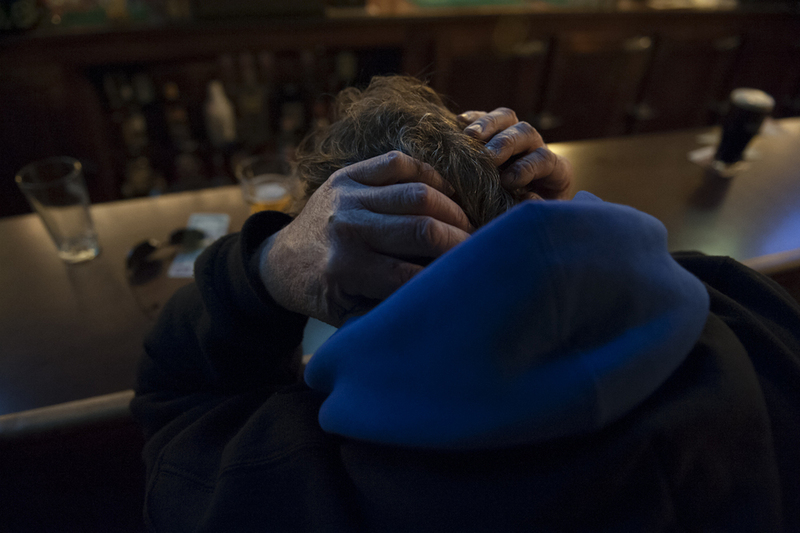 Devil in the Night, shot over the past eleven months, chronicles the lasting mental and physical losses James endured during and after Superstorm Sandy as one of Rockaways’ few remaining commercial fishermen. His relationship with the water is unique in that it is the prism through which he views his entire life. Superstorm Sandy’s surge carries a mixture of sea froth and sand over the sea wall onto Beach 138th street in Belle Harbor, Rockaway, New York. By the morning of October 30, 2012, the sea wall and the houses connected to it were destroyed. Deep sea fishing rods and reels belonging to Rockaway fisherman, James Culleton, sit unused in his bathtub. Well over six feet of storm surge flooded James’s property, which shared a fence with the local marina in Averne, Queens on the Rockaway Peninsula. James Culleton stands in what used to be his brother’s bedroom on the ground floor of James’s home. James’s brother, disabled and wheelchair-dependent, was evacuated before the storm hit. Six feet of water rushed into the ground floor, causing severe structural damage to the rear wall and ruining the furniture and other household items. “This storm…it was like a phantom, like a devil in the night. It’s just like being on a boat at night…when you don’t see it coming, it’s worse.” James Culleton. George, a friend of James Culleton and part-time fisherman, takes a break from cleaning and sorting through the contents of James’s home, which had been strewn across his yard to dry. All of James’s fishing work on land was based in sheds located in his yard. He lost all of their contents - fishing gear, boat electronics, ice machines, freezers, and refrigerators that contained hundreds of pounds of bait and fish. “It’s not to be messed with; you have to respect the water. As much as the sea will give, it will take. When the water wants to come, there ain’t no stopping it.” - James Culleton. “Sometimes the water gives, and sometimes it takes…It can take away in one minute what it took a lifetime to build.” - James Culleton. James Culleton finished paying off the mortgage on his home in 2011. After his final payment, he neglected to renew the insurance policy that had been wrapped into his mortgage payments. As a result, the damages to his home and property were entirely his responsibility, a financial burden that often seemed insurmountable. 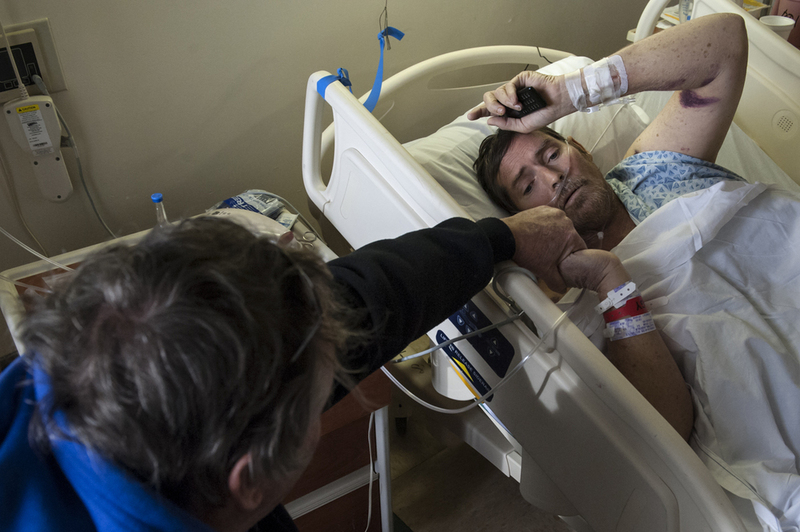 James Culleton visits his brother, Jerald, in the hospital after Jerald’s leg was amputated below the knee. Jerald, who was disabled before the storm, lived on the first floor of James’s home and depended on James to drive him to see his doctors. After Superstorm Sandy flooded both of James’s trucks, transportation became very difficult, and Jerald was unable to visit his doctors. Jerald developed a leg infection that that ultimately cost him part of his leg. James Culleton sits in Rodger’s Bar on Beach 116th street in Rockaway Park. Referring to his brother Jerald, “The guy was a great athlete, a basketball player, and all-star surfer…It’s a downhill spiral, hopefully not the end. Hopefully good things will come. I don’t know…we’ll see.” James Culleton. The Federal Emergency Management Agency evicted Frank from the hotel they provided in February 2013. For months afterwards, James stayed with friends and fellow fishermen, or slept in his truck outside the local police station. “The uncertainty of not knowing where you’re going to sleep every night, it’s freaking nuts…sometimes I would end up sleeping in my truck.” James Culleton. Captain of a charter fishing boat, James Culleton navigates the waters of Jamaica Bay in search of striped bass. His yearly income depends on the few months that the waters are open to fishing. The financial burden Superstorm Sandy left in its wake put even more pressure on James to find and catch fish this year. James Culleton prepares for a day of fishing aboard his boat, the Easy Rider, in Howard Beach, Brooklyn in the summer of 2013. After a long and troubled winter, James’s regains some normalcy in his life by returning to the water. 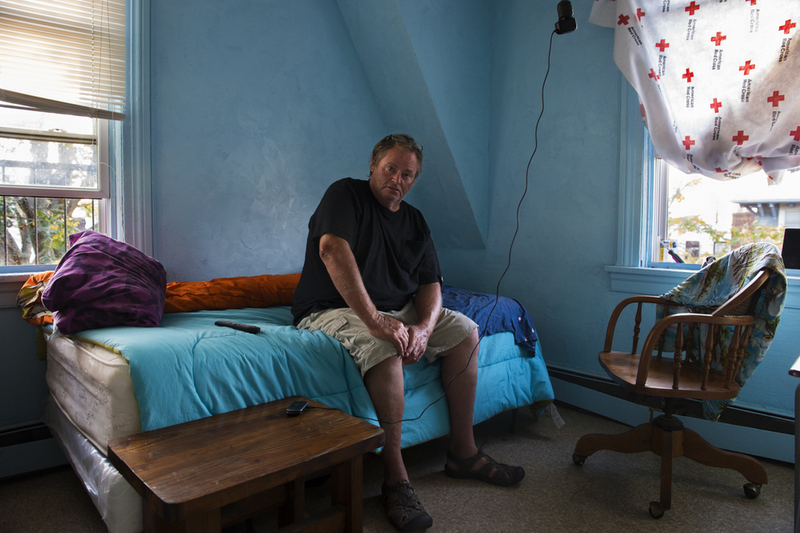 James Culleton relaxes on a late summer 2013 afternoon in his temporary home, a room in a single room occupancy residence in Rockaway Park. Despite the significant downgrade in accommodation, it is the first time since Superstorm Sandy hit that he can afford to have a place of his own. The SROs that still exist in Rockaway represent a bleaker side of the vibrant Rockaway beach community. James Culleton cleans his boat after a week of fishing. Frank grew up on the water in the Rockaways, first moving there with his family in 1957. In a rare moment of levity, James Culleton and a friend share laughs at Roger’s Bar on 116th street in Rockaway, NY. They affectionately refer to this bar as their “Club Med.” February 7, 2013. Without money to hire a contractor to fix his home, James Culleton did much of the work to date himself. But the much-needed structural repairs exceeded his abilities and remain unaddressed. His home remains uninhabitable at the one-year anniversary of Superstorm Sandy on October 29th, 2013. “I know the water will give what it took back to me…It’s not just in money, it’s spiritually. It’s the feeling when I go out there, and you hear the birds and the water and the smell…It’s a way of life.” James Culleton. After a morning of fishing, James Culleton takes a moment to rest in his room at the single room occupancy residence in Rockaway Park. “Maybe the storm was a good thing. Maybe it’ll bring more fish. Maybe it got rid of a lot of debris out there. I don’t know, stirred up the bottom and brought some life in. We’ll find out.” -James Culleton.